The High Bounce Complete 22” Skateboard is one of the top selling skateboards around at the moment. And, when you take a look at its specs, it’s not hard to see why. 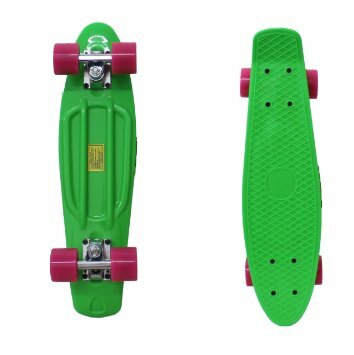 Similar to the popular Penny Skateboard, the High Bounce weighs the same and comes in a great range of colours and designs, yet it costs quite a bit less. But is this the right skateboard for you? Available in a great range of designs and colours including black, blue, green, pink, red, purple and jelly baby. A full description of the designs can be found here. For more specifications click here. Often compared to the Penny Skateboard, the High Bounce Complete certainly holds its own in the plastic skateboard market. In fact, many people have said that the High Bounce is identical to the Penny, without its high priced logo. The board itself is slick and bright, and with a great selection of colours to choose from, you are sure to find one that is suitable. We love the Jelly Bean design, but there isn’t one design from the bunch that we don’t like! The board is durable, long lasting, and easy to ride. Cruising is quiet and smooth, and turning is much easier than it can be on the more traditional skateboards. The size of the board (22”), makes it easy to carry, and you could even fit it into a backpack or bag if you needed to. We did find that you do need to break in the wheels and trucks on the High Bounce Complete 22” Skateboard, but this shouldn’t take too long, maybe around ten hours. The High Bounce Complete 22” Skateboard is a top quality plastic board, and one that we at Extreme Sports X love! It’s fun to ride, aesthetically pleasing, and available at a great price. If you can’t afford the Penny Brand, or just want an awesome board at a fraction of the cost, the High Bounce is the board to go for. Currently available for less than $45 on Amazon.com, this is a steal! This entry was posted in Other, Skateboarding, Skateboards and tagged High Bounce, High Bounce Complete 22” Skateboard, Penny, Plastic Skateboard, Review, Skateboard, Skateboarding. Bookmark the permalink.